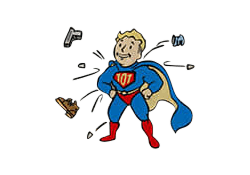 Toughness is a Perk in Fallout 4. It is associated with the Endurance Stat. Rank 1: If nothing else, you can take a beating! Instantly gain +10 Damage Resistance. Rank 2: You now have +20 Damage Resistance. Rank 4: You now have +40 Damage Resistance. Rank 5: You now have +50 Damage Resistance.